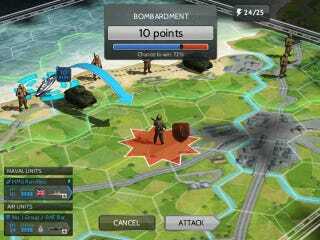 Wars and Battles is an upcoming iPad game that doesn't cover a single war. It doesn't even cover a single era of war. It's covering all the wars. It's doing this the easiest and most obvious way possible: by making an engine based on the flexible rules of tabletop wargaming, then sticking it in a video game where they can adjust things to suit a medieval cavalry charge or a clash of armoured divisions. They're not the first company to ever attempt this, but I'm liking two things here. The first is that this is on the iPad, which is becoming my go-to platform for strategy gaming on the couch. The second is that it looks good. These kind of games are often hideous affairs, with presentation best described as "functional", the art handled by people who either can't draw or don't care. But Wars and Battles looks pretty nice! It's got big, clear art on its menu, the UI looks friendly and there are even cute little 3D models of all the units. The game launches first on iPad (with six battles ranging from the 1800s to 1970s), but will later be out on PC and Mac as well, with cross-platform multiplayer promised. There'll also be new battles released every two months, and with the game's site showing horses and spears, future releases will surely go further back in time). The iPad version is out in November.